This article is the first of a three-part series taken from a forthcoming book, Education and the Crisis of Public Values to be published by Peter Lang Publishing Group. As the Obama administration’s educational reform movement increasingly adopts the interests and values of a “free-market” culture, many students graduate public schooling and higher education with an impoverished political imagination, unable to recognize injustice and unfairness. They often find themselves invested in a notion of unattached individualism that severs them from any sense of moral and social responsibility to others or to a larger notion of the common good. At the same time, those students who jeopardize the achievement of the quantifiable measures and instrumental values now used to define school success are often subjected to harsh disciplinary procedures, pushed out of schools, subjected to medical interventions or, even worse, pushed into the criminal justice system. Most of these students are poor whites and minorities of color and, increasingly, students with special needs. To be sure, the empirical emphasis of conservative school policy has been in place for decades. In keeping with this trend, the Obama administration’s educational policy under the leadership of Arne Duncan lacks a democratic vision and sense of moral direction. Consequently, it reproduces rather than diminishes many of these problems. In addition, these policies bear the trace of the ideological remnants of a second Gilded Age that repudiated civic education and schooling as a public good. Rather than arguing for educational reforms and a value shift away from the ethically deadening demands of an egocentric, consumerist society that can only respond to the lure of goods, profits and “rational investments,” Obama and Duncan are pushing the same pernicious set of values that redefine citizens as stockholders, customers and clients. Similarly, they have pushed for modes of teaching and learning that promote a formative culture that in effect produces and legitimates a culture of illiteracy and moral indifference that too closely correlates with what journalist Matt Taibbi rightly calls a “world of greed without limits.” Instead of promoting or extending “education’s democratizing influence on the nation” as part of one needed response to the corruption that led to the global recession, Duncan has fervently placed American society under the sway of an educational reform movement that is at odds with a vision of schooling dedicated to the cultivation of an informed, critical citizenry capable of actively participating and governing in a democratic society. In fact, Duncan’s understanding of school reform is contrary to forms of knowledge and pedagogy that enable rather than subvert the potential of a socially just and sustainable society. Almost all of Duncan’s polices are indebted to the codes of a market-driven business culture, legitimated through discourses of measurement, efficiency and utility. This is a discourse that values hedge fund managers over teachers, privatization over the public good, management over leadership and training over education. Duncan’s fervent support of neoliberal values are well-known and are evident in his support for high-stakes testing, charter schools, school-business alliances, merit pay, linking teacher pay to higher test scores, offering students monetary rewards for higher grades, CEO-type management, abolishing tenure, defining the purpose of schooling as largely job training, the weakening of teacher unions and blaming teachers exclusively for the failure of public schooling. His support of the firing of the entire faculty of a Central Falls High School in Rhode Island is indicative of his disdain for public school teachers and teacher unions. Although teachers and administrators have to accept responsibility for the academic performance of their students, there are often many other factors that have to be taken into consideration such as a parent’s involvement, the socio-economic status of the students, the existence of support services for students and the challenges that emerge when students do not speak English as a first language. Many of the Central Falls students did not speak English well, came from families that were poor, worked after school and had few support services and specialists at their disposal. Obama and Duncan ignored all of these factors because they have little sense of the larger socio-economic forces that bear down on schools, putting many students at a decided disadvantage when compared to their well-resourced, middle-class counterparts. Duncan has expanded the reach of his educational reform policies and is now attempting to rewrite curricular mandates. Emphasizing the practical and experiential, he seeks to gut the critical nature of theory, pedagogy and knowledge taught in colleges of education. This is an important issue to more than just teachers who are denied a voice in curricular development; it also affects whole generations of youth. Such a bold initiative reveals in very clear terms the political project that drives his reforms and what he fears about both public schooling and the teachers who labor in classrooms every day. Within the last year, Duncan has delivered a number of speeches in which he has both attacked colleges of education and called for alternative routes to teacher certification. According to Duncan, the great sin these colleges have committed in the past few decades is that they have focused too much on theory and not enough on clinical practice; and by theory he means critical pedagogy, or those theories that enable prospective teachers to situate school knowledges, practices and modes of governance within wider critical, historical, social, cultural, economic and political contexts. Duncan wants such colleges to focus on practical methods in order to prepare teachers for an outcome-based education system, which is code for pedagogical methods that are as anti-intellectual as they are politically conservative. This is a pedagogy useful for creating armies of number crunchers, reduced to supervising the administration of standardized tests, but not much more. Reducing pedagogy to the teaching of methods and data-driven performance indicators that allegedly measures scholastic ability and improve student achievement is nothing short of scandalous. Rather than provide the best means for confronting “difficult truths about the inequality of America’s political economy,” such a pedagogy produces the swindle of “blaming inequalities on individuals and groups with low test scores.” This is a pedagogy that sabotages any attempt at self-reflection and quality education, all the while providing an excuse for producing moral comas and a flight from responsibility. In my seven years as CEO of the Chicago Public Schools and in my current job as I’ve traveled the country, I’ve had hundreds of conversations with great young teachers…. In particular they say two things about their training in ed school. First, most of them say they did not get the hands-on practical teacher training about managing the classroom that they needed, especially for high-needs students. And second, they say there were not taught how to use data to differentiate and improve instruction and boost student learning. Louisiana’s expulsion rate is five times the national rate, nearly 16,000 middle and high school students drop out each year and public schools in the state dole out over 300,000 out-of-school suspensions a year. Within the state-run Recovery School District direct operated schools, the expulsion rate is ten times the national rate and 1 in every 4 students was suspended in a single year, twice the statewide rate and over four times the national rate. State law, as currently written, contributes to the problem, allowing principals to suspend students for a wide range of minor misbehavior, including “willful disobedience,” disrespecting school staff and using “unchaste or profane language.” Moreover, the overuse of harsh discipline disproportionately affects some Louisiana school children over others. African American students make up 44% of the statewide public school population, but 68% of suspensions and 72.5% of expulsions. And in school districts with a larger percentage of African American and low-income students, there are higher rates of suspension and expulsion. These districts tend to have fewer resources for positive interventions. When educational reform neglects matters of politics, critical thinking, creativity and the power of the imagination, it loses its hold on preparing young people for a democratic future and condemns them to a world where the only values that matter are individual acquisition, unchecked materialism, economic growth and a winner-take-all mentality. The diverse range of political, economic, racial and social forces that influence all aspects of schooling need to be critically engaged and rearticulated in the interest of justice, human development, freedom and equal opportunity. These are not merely political issues, they are also pedagogical concerns and the former cannot be separated from the latter, just as equity cannot be separated from matters of excellence. Defining schools exclusively in terms of mathematical coordinates and statistical formulas suggests that Duncan has no language for addressing schools as sites or teachers as engaged intellectuals that mediate, accommodate, reproduce and sometimes challenge the diverse and often anti-democratic forces that bear down on them. If schools are increasingly being governed through a culture modeled after prisons as I have suggested in “Youth in a Suspect Society,” how does one understand the growth of this model of schooling and what might it tell us about the transformation of the state and the expansion of the criminal justice system into more and more aspects of everyday life, extending from the classroom to the welfare system? What does it mean to ignore the increasing corporatization, privatization and militarization of schools at a time when all aspects of public life are under siege by corporate and market-driven forces? How can schools fulfill their democratic mission when they are shaped by a social order characterized by massive inequalities in wealth and power? The methodology madness paradigm considers these dangerous questions, just as it believes that the theories and pedagogical practices that make such questions possible off limits to colleges and programs of education. Surely, under such circumstances, we have joined Alice in falling into the rabbit hole. These are not questions Duncan seems remotely interested in addressing, primarily because his obsession with instrumental values holds both public schools and public values in contempt. Surely, prospective teachers should have some idea, some sort of theoretical model, if not also diverse vocabularies and varied paradigms in order to understand the social forces that currently impact students, schools, the policy environment surrounding schools and teaching itself, which often take place in contexts that vastly differ according to a range of social and economic determinants. Duncan’s attack on theory and critical thinking is not only rooted in the most perverse form of anti-intellectualism; it is also in lockstep with a conservative and corporate educational reform movement driven by an ideological agenda largely shaped by a number of anti-public conservative foundations, politicians, legislators and intellectuals who argue for deregulation and exhibit a strange obsession with crunching numbers. Ironically, this argument comes at a time when deregulation and ethical dishonesty are largely seen as some of the reasons behind the massive economic meltdown. Practices, techniques and methodologies do not speak for themselves and they are meaningless unless they are subject to critical interrogation and examined both through specific theoretical frameworks and the theoretical values they attempt to legitimate, particularly when used to support dominant modes of authority, teaching and learning. The presupposition that practice is not bound to submit to norms or is unmediated by theoretical paradigms is as anti-intellectual as it is depoliticizing. The real issue is whether teachers are aware of and reflective about the theoretical frameworks and norms that inform their work. At the very least, being attentive to matters of theory enables them to better understand the ethical values, ideologies and political visions that inform different forms of practice. Surely, Steiner is too smart to accept the preposterous notion that theory is more of a pathology and a threat than an invaluable resource. It is hard to imagine him faulting the role that theory might play in enabling teachers to be thoughtful about the social, cultural, psychological and political forces that shape classroom knowledge and produce hidden structures of meaning beneath officially sanctioned narratives. It is also hard to accept his belief that it is impossible for theory to provide teachers with possibilities for not only differentiating among diverse forms of classroom practice, but also for producing new forms of practice. Theory is the condition that enables teachers and students to be self-reflexive, develop better forms of knowledge and classroom skills and gain an understanding of the contexts in which they teach and learn, which have already been constructed through struggles over theories that make a claim to legitimating what kind of knowledge and practice count in a classroom. Theory creates the possibilities for being reflective about meaning and its effects; and it’s a powerful tool for understanding how to interrogate those pedagogical spaces in which identities, values and social relations are in play within diverse situations of power. Steiner’s rejection of theory as a rather useless abstraction is really an attack on the productive nature of pedagogy itself and with equipping teachers with the skills they need to be critical, autonomous agents in the classroom. It is precisely this rejection of theory that prevents teachers from addressing the right-wing policies now being enacted in Texas and Arizona, which are as morally repugnant as they are intellectually comatose. At the same time, this anti-theory retreat into the world of methods and instrumental rationality is more than a retreat from the world in all of its political and social complexity – it is likewise a move away from any understanding of the public school as a bastion of democratic learning and civic pedagogy, just as it is a retreat from any measure of moral and social responsibility. This is a dangerous and difficult stance to take at a time when the country is besieged by massive corruption, a lack of political vision and a moral void that promote bigotry, massive exploitation and a dangerous national chauvinism. I was both surprised and distressed by this response, as were a number of other people in the conference. Steiner’s response revealed a buried order of conservative politics that lies beneath his rhetoric about practice while, at the same time, offering insight about what it is about Steiner’s policies as a model for educational reform throughout the country that attracts Arne Duncan’s spirited support. I can only assume that the object of Steiner’s critique of social justice programs is critical thought itself, which is labeled by its detractors as a form of negativism, while those who deploy critiques of the status quo are stereotyped as cynical, resentful and un-American. While it would be unfair to compare Steiner with Tom Horne, the xenophobic Arizona superintendent of public schools, he has used the same argument against thoughtful critique, labeling it as a downer and unworthy of having a place in the public schools, particularly when it takes the form of ethnic studies programs. Not only is such an argument at odds with an open democratic society, it is fundamentally part of a authoritarian model of pedagogy that ultimately seeks to erase any notion of history considered at odds with official narratives. Duncan and Steiner reify pedagogy by stripping it of its political and ethical referents and transforming it into a grab bag of practical methods and techniques. Neither of them can theorize the productive character of pedagogy as a political and moral discourse. Hence, both are silent about the institutional conditions that bear down on the ability of teachers to link conception with execution and what it means to develop a better understanding of pedagogy as a struggle over the shaping of particular identities. Nor can they raise questions about education as a form of political intervention that offers the conditions for teachers to create potentially empowering or disempowering spaces for students, critically interrogate the role of teacher authority or engage the limits of established academic subjects in sustaining critical dialogues about educational aims and practices. These questions barely scratch the surface of issues that are often excluded when education is linked solely to the teaching of content and pedagogy is instrumentalized to the point of irrelevance. Pedagogy is never innocent. But if it is to be understood and made problematic as a moral and political practice, educators must not only critically question and register their own subjective involvement in how and what they teach, they must also resist calls to transform pedagogy into the mere application of standardized practical methods and techniques. Otherwise, teachers become indifferent to the ethical and political dimensions of their own authority and practice. There is no escaping the detour through theory that every pedagogical practice must take, just as it is impossible to suggest that schools are somehow neutral institutions that can ignore the ways in which social, ethical and political norms bear down on almost every aspect of schooling and classroom teaching. In fact, one can reasonably argue that most of what is learned in schools takes place through a hidden curriculum in which particular forms of knowledge, culture, values and desires are taught, but never talked about or made public. One only has to mention as a case in point the ways in which schools increasingly function as part of a circuit of power that produces the school-to-prison pipeline. One would be hard pressed to find any educator who claims that his or her school participates in such a vicious process and, yet, the hard realities of such practices bear down on poor minority children everyday as part of the hidden curriculum of schooling. Missing from Duncan and Steiner’s celebration of data driven teaching is any concern about the complex and often contradictory role that schools play in either extending or closing down the possibilities for students to participate within a wider democratic culture. Nor is there any interest in exploring how power works through particular texts, social practices and institutional structures to produce differences organized around complex forms of subordination and empowerment. Given these omissions, it is not surprising that little is said about how the dominant culture of schooling legitimates as well as excludes, under vastly different conditions of learning, those students who are marginalized by class and race. Nor is much said about what ideological and institutional conditions are necessary to provide teachers with the opportunities they need to function as critical public intellectuals rather than as robotic data retrievers. Duncan and Steiner seem mute on the issue of what it means to turn their empirically-based views of classroom practice into an exploration of the limits of such practice and empirically-based knowledge itself. Of course, practice on its own tells us nothing, because it is always subject to various theoretical, historical and social categories through which it is framed and experienced. Educational practice gets its meaning not simply by being emulated, but by how it is reflected upon, critically mediated and thoughtfully engaged, just like any other body of knowledge. I think that Duncan and Steiner’s hostility to theory and critical pedagogy is less about their presence in various educational programs and schools of education than it is about the potential of certain types of theory and pedagogical practices to raise questions at odds with their right-wing support for the corporate elite’s version of school reform. How else to explain Steiner’s ludicrous statements reported in The New York Times that “colleges of education still devote too much class time to abstract notions about [what he calls] ‘the role of school in democracy’ and ‘the view by some that schools exist to perpetuate a social hierarchy'”? Steiner’s disdain for having future teachers analyze the role of schools and pedagogy itself through larger political, social and economic categories is palpable. Steiner’s fear of teachers and students viewing public and higher education as crucial forces for creating critical citizens and viable spheres for learning about and defending democratic values, identities and social relations says a great deal about his own politics and disdain for public values. Of course, Steiner became the golden boy for the neoconservative movement after publishing an article in 2005 in which he analyzed the syllabi in foundations courses from 16 elite schools of education and concluded that, since there was a disproportionate number of progressive authors being read in those courses, these education programs must be dominated by left-leaning ideologies.Needless to say, this type of ideologically-based research begins with a premise and then looks for the evidence to support it. Not only is there a long history of left professors being wrongfully denied tenure in such schools, myself included, but the departments that often dominate these schools such as the departments of educational administration, leadership, policy and psychology are often the most powerful and conservative within colleges and schools of education. As is well known, schools of education are among the most conservative and deeply anti-intellectual colleges on campuses; they are, in many cases, already concerned with teaching methods, and for this they are certainly deserving of criticism. 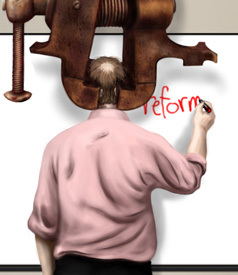 Unfortunately, Steiner ignores the current situation, and in the name of reform, simply amplifies these problems. Moreover, course syllabi tell us nothing about how books are interpreted by either professors or students. Steiner’s own claims to being impartial are as bogus as is his research. Missing from Steiner’s views on education are crucial questions regarding what matters beyond learning methods, taking tests, using data and celebrating technocratic modes of rationality. What kind of education do we need for young people to become informed citizens capable of learning how to govern rather than simply be governed? What kind of education do we need to create a generation of young people willing to engage, defend and struggle for the ideals and social relations that offer the promise of social justice and substantive democracy? Given the crucial importance of public school teachers in providing students with the knowledge and imagination they will need to further the ideals, social relations and institutions crucial to an aspiring democracy, the Obama-Duncan view of educational reform must be steadfastly rejected. Many teachers, students, workers, and many others feel an acute sense of betrayal and moral indignation as the social state is dismantled, the moral compact dissolved, politicians scramble to protect the privileged, wealthy and mega corporations are provided with massive bailouts, while the burden for the current economic recession is placed on the working and middle classes. The formative educational culture necessary for creating both critical citizens and a robust democracy is under major attack in the United States. And this is most evident in the assault that Duncan is waging against public schools, teachers and colleges of education. The Obama administration’s educational policy appears to favor an education system and a broader cultural apparatus that are utterly commodified, instrumentalized and dominated by private rather than public considerations. Curiously, despite some skepticism regarding market-driven values being expressed by those involved in the financial sector in the United States, debates over education seem to be one of the few places left where neoliberal values are asserting themselves in an entirely unreflective way. The strict emphasis on individual competition, private goods and unbridled self-interest now finds its counterpart in the disparagement of any pedagogy that encourages criticism, critical dialogue and thoughtful exchange. The latter are core elements of any viable classroom pedagogy and any call to either eliminate such practices from schools or to subordinate them to a sterile form of instrumental rationality serves the interests of a closed and authoritarian social order rather than an open and democratic society. The pedagogical conditions necessary to reclaim a formative culture of political literacy suggest that we take matters of education seriously if we are going to survive as a democracy. At the very least, it is time for Americans to take note of the fundamental importance of retaining educational theories and pedagogical practices that produce the knowledge, values and formative culture necessary for young people to believe that democracy is worth fighting for.